We’re living in a new media marketing era. It’s noisy and it’s crowded. People’s email inboxes are overflowing. Web ads and pop-ups and prestitials are in your face. Not to mention the social media overload. Buyers are tuning out. Their eyes have glazed over. Bombarding your prospects with an unending stream of sales messages is no longer the answer. So how do you stand out from the crowd? How do you have your buyers and prospects look forward to hearing from you? How do you build awareness … loyalty … and your customer base? More and more marketers and content creators from around the world are discovering that an effective content strategy is essential to staying ahead of the curve. At Content Marketing World Master Class, you’ll have a chance to learn from and interact with many of today’s top content strategists who have had a hand in shaping the industry into what it is today. Is Content Marketing World Master Class for me? Well, let’s see. Are you a marketing/PR professional who develops strategy? 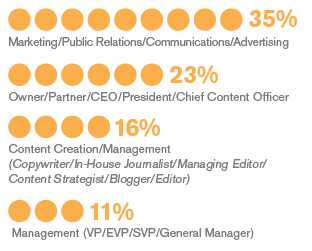 Do you handle the content marketing initiatives? Are you curating valuable, relevant, compelling content? Is your boss looking to you to tap into one or multiple channels to attract and retain customers? Is “find content” for social sites, mobile platform, or corporate magazine on your to-do list? Check out details on the six Master Classes we’ll be hosting this year!